With loan officers, it’s all about numbers. The top producers can tell you how many deals they did last week, last month, and last year. They know who their best referral sources are and where every closing came from. They want, and need to work for a company that can do the same. Brad Finkelstein, an editor at National Mortgage News, relays the findings of a survey conducted by Majestic Consulting that finds being able to close loans on schedule, and receiving proper training are of more concern to top loan officers than compensation. In the competitive real estate market, top producers want to work in a quality office. They will leave a company if they find another with better operations. The secret to recruiting is in looking for the right candidates and presenting yourself as the right employer. Knowing the strengths of your company and using that in your search is a start. Having the right process for recruiting is essential. The top loan officers want to work in an office with both staff and technology support. Having confidence in the team gives the loan officer power in creating the best solution for the client and thus making the entire office successful. Training and enrichment will help retain employees who are serious about their careers. Invest in technologies and processes that support the work and the sales process. The more you help your loan officers be successful, the more successful your office will be. 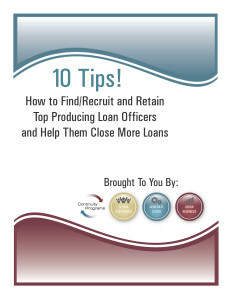 You need a detailed plan to not only recruit and retain loan officers but also to help them achieve continuing success. More now than ever, you need to focus your efforts to find, recruit and retain top producing loan officers – and help them close more loans. Check out these ten powerful tips for finding top producing loan officers and helping them close more loans. That is interesting that with loan officers it is all about the numbers. I love that loan officers can help refer you to the best service out there. Creating a loan schedule ahead of time sounds like a good way to keep organized.